Site access. Change the level of access between Basic and Admin levels for the SecureAnywhere website (Home panel of my.secureanywhere.com) and the Management Portal of Endpoint Protection. Groups. Specify whether the user can create and modify groups of endpoints, deactivate or reactivate endpoints, or assign endpoints to groups. Policies. Specify whether the user can create and modify policies or assign policies to endpoints. Overrides. Specify whether the user can make overrides to files, designating them as "good" or "bad." Commands. Specify what types of commands the user can issue to the endpoints. Alerts. Allow this user to create and edit warning messages. Open the Endpoint Protection menu by clicking the arrow next to your login ID, then click Manage Users. Locate the row for the user you want to edit, then click that user's edit icon. The edit icon is at the far right, as shown in the following example. The User Details panel opens. Click the Access & Permissions tab to see the list of Endpoint Protection functions and their associated access permissions. Assign access permissions for this user, as described in the following table. When you're done, click Save Access & Permissions. Groups Create & Edit. Define and modify groups of endpoints. Deactivate/Reactivate Endpoints. Deactivate and reactivate endpoints from the Management Portal. See Deactivating endpoints. Assign Endpoints to Groups. Allows the portal user to move one or more endpoints from one group to another. See Organizing endpoints into groups. Policies Create & Edit. Define, delete, rename, copy, and export policies. Assign Policies to Endpoints. Associate a policy with an endpoint or group of endpoints. Overrides MD5. Override how a file is detected by entering the MD5 value of a file. MD5 (Message-Digest algorithm 5) is a cryptographic hash function that acts like a fingerprint to uniquely identify a file. Good — Allow files containing the specified MD5 value. Bad — Block files containing the specified MD5 value. When a scan encounters this file, it flags it and requests action from the SecureAnywhere user. Good & Bad — Allow either Good or Bad. Commands None. Do not allow this user to send commands to endpoints. Simple. Access to the Agent and Clear Data commands, and view commands for selected endpoints. Advanced. Access to Agent, Clear Data, Keycode, Power & User Access, Antimalware Tools, Files & Processes commands, and view commands for selected endpoints. Expert. Access all commands, including Expert Advanced options. See Issuing commands to endpoints. Alerts Create & Edit. 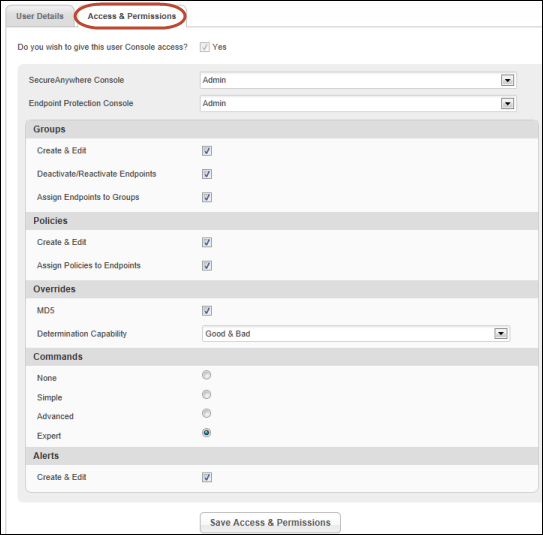 Configure instant or scheduled alerts for endpoint activity.